Sunday Afternoon Walk at the Arbor Hills Nature Preserve - Jimmie Aaron Kepler, Ed.D. This morning I was around 6:00 AM. I prepared a cup of coffee, spent some time reading, and then did some editing before going to church. I also ate breakfast. My wife and I are members of Prestonwood Baptist Church in Plano, Texas and attend regularly, about 50 Sundays out of the year. After church, we went to Mama’s Daughter’s Diner in Plano for lunch. We then headed home. When my wife took a nap, I headed to the gasoline station to fill up her car. Then I drove to the Arbor Hills Nature Preserve in Plano, Texas. It is located in west Plano where the borders of the cities of Plano, Carrollton, and The Colony meet. I had my iPod where which also has an FM Radio built-in. The earplugs act as the antenna. I listened to the St Louis Blues play the Dallas Stars in the Stanley Cup National Hockey League Playoffs while I walked. It is located on West Parker Road, in Plano, Texas. The photo is of the entrance sign looking toward the east. In the background of the above picture is one of the City of Plano’s fire stations. As you drive into the Arbor Hills Nature Preserve you will find adequate parking. They have sidewalks were you don’t have t walk in the street. 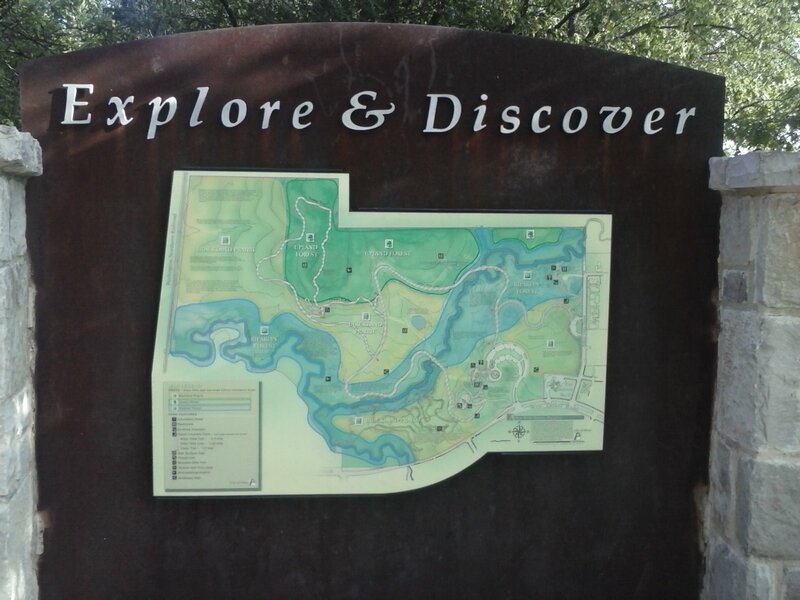 The Arbor Hills Nature Preserve is located on the western border of Plano, Arbor Hills Nature Preserve is a 200-acre park featuring vast areas of natural beauty for walking, jogging, hiking, orienteering, and other outdoor activity. The paved recreational trail is about 2.6 miles in length. There are also a natural unpaved trail for pedestrians only that is about 2.6 miles). There is a designated off-cycling trail of 2.8 miles. It also has a natural biofilter for cleaning surface run-off from the parking lot before it reenters the ground water tables as well as an observation tower, playground, restrooms, and pavilion. I’m sharing many pictures I took during my walks. The Arbor Hills Nature Preserve has three distinct areas. It is located in the city of Plano. Here is a map to help you explore and discover the preserve. One of the areas of the preserve is the Upland Forest. 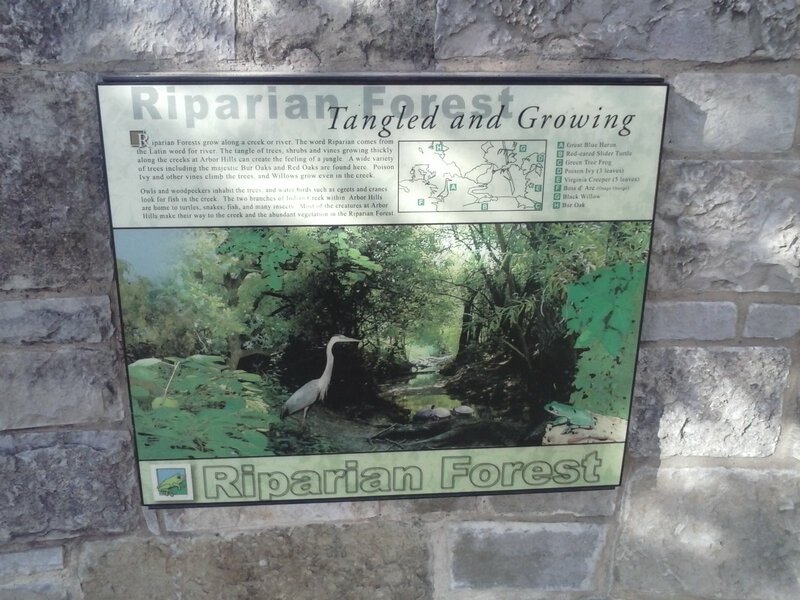 A third area is Riparian Forest (that is forest along the creeks and streams). Here are a few pictures of the pavilion area. A third picture of the pavilion area. The concrete in the pavilion area has some designs in them. From the pavilion, you can see the playground. Near the pavilion is the restroom. It is near the parking area as well. As you leave the pavilion area you head south. The concrete walkway has a center yellow stripe. The ask that you keep right except to pass. A large number of people walk the trails and ride their bikes on the trails. The go and come in both directions. Many people bring their dogs. The dog must be on a leash and you have to clean up after your four-legged friend. Another view of the playground. The grass along the trail is well maintained. The are signs with instructions along the trail. There are off-road bicycle trails. Trash cans and benches are along the trail. Instruction signs greet you from time to time. Here is a trail off the main trail that returns to the pavilion. 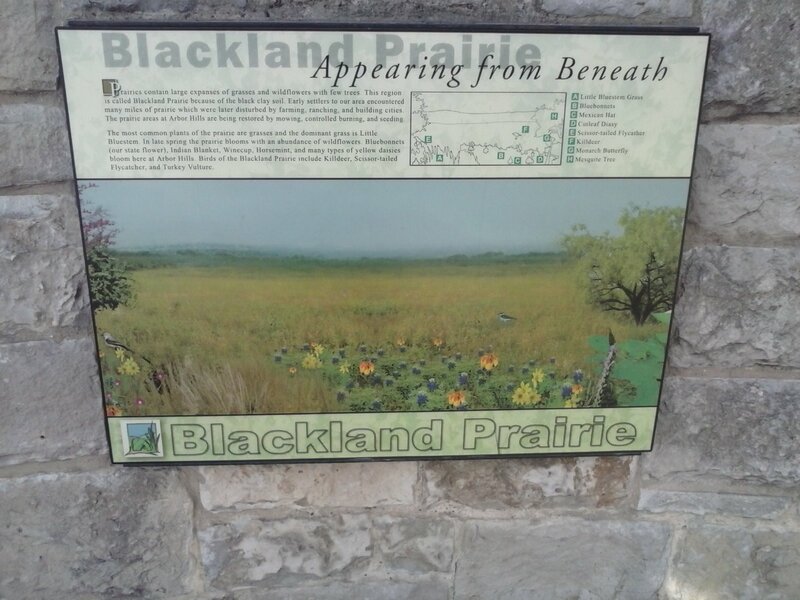 There is lots of Blackland Prairie. Signs warn you to beware of critters. A view from the main walking trail back up at the pavilion. The trails go through many different settings. I tried to take pictures without people on the trail. Some folks get upset if they think you are photographing them. As you walk you cross several bridges. There are creeks and streams throughout the preserve. I took this picture from the bridge looking north. Along the concrete trail are off-road trails. The one just ahead is the prairie trail. Continuing down the main trail. The scenery can change as you go around a bend on the trail. You go down the hill, and into the Riparian Forest (that is forest along the creeks and streams). It gives you a right mix of moving from the sun to shade. Some of the trees are tall. Here is the entrance to the Outer Loop Trail. Benches are found along the trail. Parts of the trail are on flat ground. It crosses the Blackland Prairie. Another off-road trail is ahead on the right. The off-road trails are well marked and worn from use. You find cedar trees in the preserve. There are different types of trees. The preserve takes erosion control seriously. The are large hills to climb with major elevation changes along the walking trail. Here is a view of the observation tower. Looking down the hill onto the Blackland Prairie. Another view of the observation tower. This is taken from the west side of the tower facing east. Looking to the northwest. I live about six miles away in that direction. This is a large mesquite tree with a bench in its shade. You are still walking uphill at a gentle slope. As we near the top of the hill, we start into the Upland Forest. It is very pretty terrain. My photos are in the sequence of my 2.6 plus mile walk around the preserve. Another trail heading off the concrete trail. If you look close you can see cars in a parking lot in the background. This is at Austin Ranch in The Colony, Texas. Austin Ranch borders the preserve. This is at the highest point of elevation. The Outer Trail comes close to the concrete trail. As you start back down the hill you come to the observation tower. There is a side trail right before the observation tower. This is a view of the last side trail from the observation tower. Still another view from the tower. A view from the observation tower back to the main concrete trail. Descending from the observation tower. Along the concrete trail from time to time, I found chalk art. Another dirt trail off the main trail. Another bridge over a creek. A view from the next bridge. Almost back to the pavilion and parking lot. Cars and the parking lot at the top of the hill. I walked 6,500 steps or about 3.25 miles. I enjoy a leisurely walk. Arbor Hills Nature Preserve in Plano, Texas is an urban gem. Do you see the rabbit? I saw this one when first leaving the parking lot. I think we scared each other when I looked to my right and saw this deer not ten feet away. If you got off the concrete trails you saw more critters like the turtles.